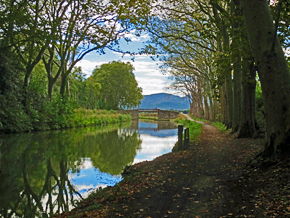 The Canal du Midi is a remarkable engineering feat by Pierre-Paul Riquet dating back to 1681. Designated as a UNESCO World Heritage Site, it traverses through the Languedoc wine region with views of the Pyrenees to the south and the Black Mountains to the north. The canal is lined with towering plane trees making it picturesque and comfortable during the hot summers. The ancient villages and towpaths along the canal encourage passengers to walk or bike while the barge floats along. 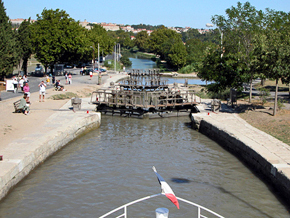 Stretching from Toulouse to the Mediterranean, the most popular section for barge cruising is between Carcassonne and Beziers with a few barges extending their route in either direction. With interesting Roman and Cathar history, the vibrant market town of Narbonne, Mediterranean cuisine, a wide variety of wines, the perched village of Minerve and more, this region offers not only exquisite cruising but diverse activities all with the laid back ambiance of southern France. From owner operated barges to company owned boutique barges, there is a wide assortment to choose from in a variety of categories and prices. Thank you for letting us help you select and book your barge cruise on the Canal du Midi.